A group that is working to influence the Israeli elections is currently receiving funding from the U.S. Department of State, according to public records and statements from the organization. The Abraham Fund Initiatives, which is leading an effort to increase Arab voter turnout for the elections on Tuesday, received a $98,000 grant from the State Department’s Middle East Partnership Initiative in September, the group said on Tuesday. The grant is funded through December 2015. The State Department’s funding process came under scrutiny in January, after the Free Beacon reported that the nonprofit group OneVoice—which is involved in a similar initiative to increase voter turnout among left-leaning voters—had received grants from the agency. The OneVoice grant ended at the end of November, before the Israeli elections were announced, according to the State Department. However, a bipartisan Senate committee is currently investigating whether any of the government funding received by OneVoice was later used for election-related activities. Aaron Klein, an American journalist based in Tel Aviv, first reported on the Abraham Fund’s Arab get-out-the-vote initiative last week, and noted that the group had received State Department funding in the past. That prior grant for $999,000 expired in 2013. Arab-Israeli voters traditionally oppose right-leaning parties, such as Israeli Prime Minister Benjamin Netanyahu’s Likud. The Arab-Israeli community is expected to play a large role in Tuesday’s election, after its four main representative parties merged in January. Last month, the Free Beacon reported on a private memo drafted in December by the nonprofit Ameinu, which outlined a plan for a coalition of groups to help increase Arab voter turnout in Israel. Ameinu said in the memo that it was consulting with President Obama’s 2012 reelection team on the initiative. Obama’s former campaign aides, including the strategist Jeremy Bird, have been assisting an anti-Netanyahu voter drive led by V15 and OneVoice, Haaretz first reported. The Ameinu proposal is strikingly similar to the Abraham Initiative’s "Broad-Based Action Plan to Increase the Participation of Arab Citizens in upcoming Elections for Knesset," which it recently published on its website. The Abraham Fund plan includes targeted polling, grassroots organizing, engagement with political leaders and celebrities, and other election-related activities. The Abraham Fund’s current State Department grant, which began on Sept. 30, 2014, is for its youth civics and career training program. According to the Abraham Fund’s election action plan, 20 of the participants in its "young political leaders" program have been working on its get-out-the-vote operation. 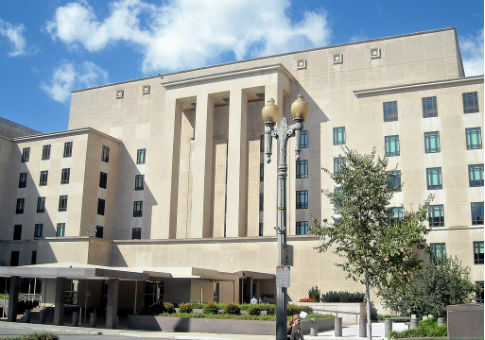 Amnon Be’eri-Sulitzeanu, the Abraham Fund’s co-executive director in Israel, said the current State Department grant is not being used for the election efforts. He said the funding "is directed for vocational training and preparation for integration into the workforce among Israeli Arab citizens at the age of 18 to 22." Be’eri-Sulitzeanu said the group has not discussed its voter initiative with the State Department or officials at the U.S. embassy in Tel Aviv.He said the group previously received two grants from the U.S. government for teaching Arabic language and teaching multiculturalism to Israeli police, both of which expired several years ago. The Free Beacon reported last month that Givat Haviva, another progressive group working to increase Arab-Israeli voter participation, met with top officials at the U.S. embassy in Tel Aviv in late January. The State Department also expedited visas for a delegation of Arab-Israeli mayors organized by Givat Haviva, which traveled to the U.S. last month to learn political organizing techniques. Givat Haviva was scheduled to meet with officials at the State Department during the trip, but the meeting was canceled at the last minute, according to one of the delegation’s organizers. This entry was posted in Issues and tagged Israel, State Department. Bookmark the permalink.